The lava of the volcano on which the world sits is the disaffection the Musalmans nurse towards the kafirs. Its chemistry world over is the Islamic religious rigidity, compounded in India by the Hindu historical hurt that is catalyzed with the expediency of the political class. The Indian landscape is dotted with many of its earlier eruptions, but the one in Godhra affected everyone as never before. That a fanatical band of Musalmans should dare torch their Ram Sevaks in a railway coach seemed to the Sangh Parivar like Saladin crossing the Lakshman Rekha. Of course, that the neighborhood Hindus joined the hysterical mobs to burn their persons and property was beyond belief to the ghettoed Muhammadans. While the prospect of the new Hindu reality spoiling their party was something galling to the pseudo-secular politicians, for the media world all this seemed godsend ‘breaking news’. Thus the ill-informed columnists as well as the dull-witted idiotbox-wallahs began scoring a Brownie point or two into the Indian pseudo-secular goal. But, the half-red intellectuals, shy as ever to stare at the problem straight in its face, have chosen to push it all under the carpet. Well, given the cyclic character of the Hindu-Muslim riots, won’t they repeat the lament at the next turn? And the politicians of all hues, alive as they are to every opportunity that presents itself to consolidate their constituency, wouldn’t let this pass. They seem to be in no hurry to leave the scene, and continue to stoke the communal fires to keep the electorate warm. The problem with a problem is that until one admits that it exists, one cannot address it, and unless it is addressed, it persists. Make no mistake there is this Musalman-kafir problem for the world to contend with, and the Hindu-Muslim disaffection is but its Indian edition. 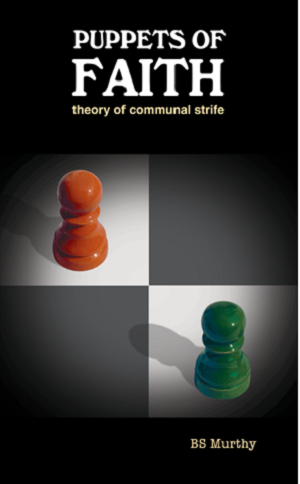 The pseudo-secular sophistry has it that when it comes to the basic tenets, all religions carry a premium on peace making and all the believers seek social harmony but for a few misguided fanatical elements on either side of the communal divide. But, sadly, the ground reality is that to the average Hindu, it seems as if the Musalmans suffer from the symptoms of Islamic fever caused by a diseased mind-set afflicted by the sharia fervor. The Muslim compliment to the Hindu is the contemptuous kafir, destined for hell, and all that goes with it. Indeed, it is but owing to our glossing over these entrenched misgivings that we let the communal lava erupt periodically. This book seeks to outline the background of the Musalman-kafir animosity on one hand, and the Hindu–Muslim communal divide on the other. It would seem that these are the products of one or more of the scriptural notions, religious dogma, medieval history and modern politics, or all put together. As one cannot understand man unless he understands his religion, all must be abreast of the basic religious tenets of the competing or conflicting faiths. Then, it would be revealing how the religious scriptures per se contribute to social discord and communal disaffection, and/or both. In the strife torn world of ours, it’s our grasp of this canvas of conflict that might eventually enable us to paint the picture of peaceful coexistence. Thus, the social evolution as well as the spiritual ethos of Hinduism and Buddhism on one hand and that of the Judaism, Christianity and Islam on the other are sketched here. Also, since man carries the historical deadwood, in spite of himself, the history that connects and disconnects the Semitic religions and that which divides the Hindu-Muslim emotions is recalled to appreciate the background to the continuing strife. After all, there is more to religion than that meets the eye, and that is the overriding faith and feeling of the believers. Besides, as the Islamic creed is more so a product of Muhammad’s persona, the influence of his character in shaping the ethos of the Musalmans has been analyzed. Won’t the Musalmans themselves concede that their endeavor would be to follow the straight path of Islam as earnestly as they could, as others, anyway, have strayed onto the satanic path? And it is this mind-set that makes the Musalmans apart in the religious sense. How this could possibly govern the Muslim psyche is scanned with “I’m Ok – You’re Ok”, the famous work of Thomas A. Harris, with their religious creed from Roland E Miller’s “Muslim Friends–Their Faith and Feeling”, as the probe. All this might not only enable the ‘the others’ to appreciate the Muslim constraints but also understand their own aberrations. Likewise, it could be hoped that the Musalmans too would ponder over the apprehensions of the ‘the others’ as well as their own afflictions that are behind the Musalman-kafir confrontation. Continued to "Advent of Dharma"